I can't hit back at girl's on the playground (or anywhere else for that matter). This day changed me forever. Well, until I got married. Depeche Mode, Personal Jesus 1989. From the album Violator, I sure felt violated that day. Possibly their best album, dark, brooding, it hit me right between the eyes as a teenager. I thought she was my salvation until I was served a "playground restraining order." Hall and Oates, She's Gone 1973. Released the year I was born, the lyrics couldn't be more fitting and this is one of my favorite bands of the 80's. This song could have been used for any of the "girl's that left me" stories. 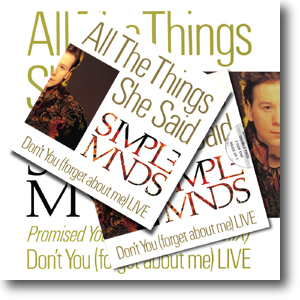 Simple Minds, All the Things She Said 1985. I first heard Simple Minds with their hit from Breakfast Club, "Don't You (Forget about me)." Great movie, great song. This is one of their other greatest hits that is on constant rotation on my mp3 player or internet radio. Any of these three songs could be playing in the background during this story of a broken heart and lost love. I don't remember much from my childhood, but I do remember all the things she said that day.